You. Me. Ride This Crazy Train - Adventures and Observations on The GO: Fun while it was lasted: RIP @GOTrainsit 08-05-13 to 08-07-13? (record scratch) ACCOUNT REINSTATED!!! Fun while it was lasted: RIP @GOTrainsit 08-05-13 to 08-07-13? (record scratch) ACCOUNT REINSTATED!!! @GOTrainsit managed to get his Twitter account back! Sometime over the weekend the twitter account @GOTrainsit was created. The person followed me and a few others and posted 1 to 2 tweets. I paid no attention. I had high hopes for this person who saw an opportunity (targeting people spelling @GOTransit wrong ala @UnitedAirlanes) and was expecting great things to come. Unfortunately, I think a couple of tweets went too far and I learned this morning that @GOTrainsit has been suspended. The person who started the account emailed me to tell me this so I asked for screenshots of the tweet(s) that I think did the person in. Note the use of the word "We". The first rule of Twitter? Impersonation: You may not impersonate others through the Twitter service in a manner that does or is intended to mislead, confuse, or deceive others. 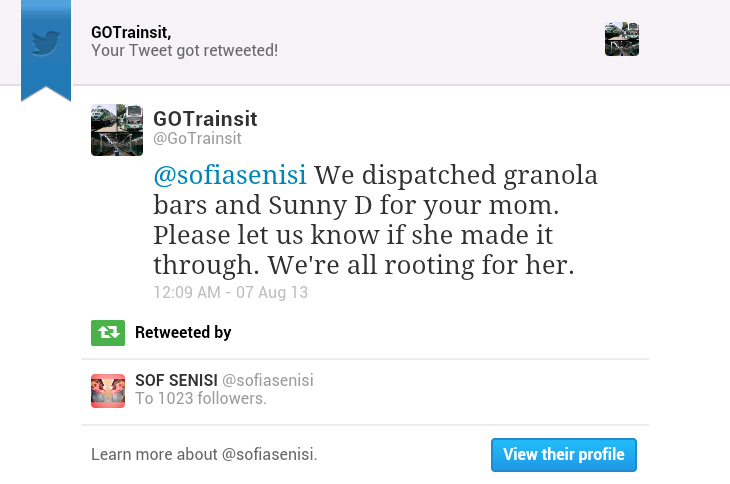 Now Twitter didn't find @GOTrainsit on its own. Someone complained. Sure, it may not be everyone's idea of comedy but the person had a great idea. It's just the execution that went awry and it can be corrected. Parody accounts are a hallmark of Twitter! 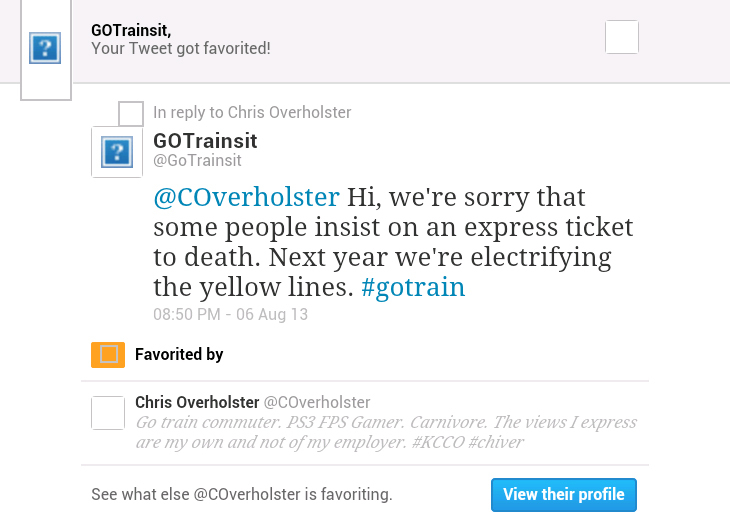 I think @GOTrainsit should appeal the suspension. I hope he considers it. Okay, I will appeal it. I know I got carried away and should have never used "We". This poses a challenge. Does that mean I can't use "our" as well?